The state parks here running along the west coast are all worth seeing. Each one has a different amount of water front property beside lakes, rivers or the ocean. Some lie adjacent to mud flats and shellfish sloughs as well as true estuaries where nutrient rich fresh water runs down to join salt water creating unique wildlife situations. 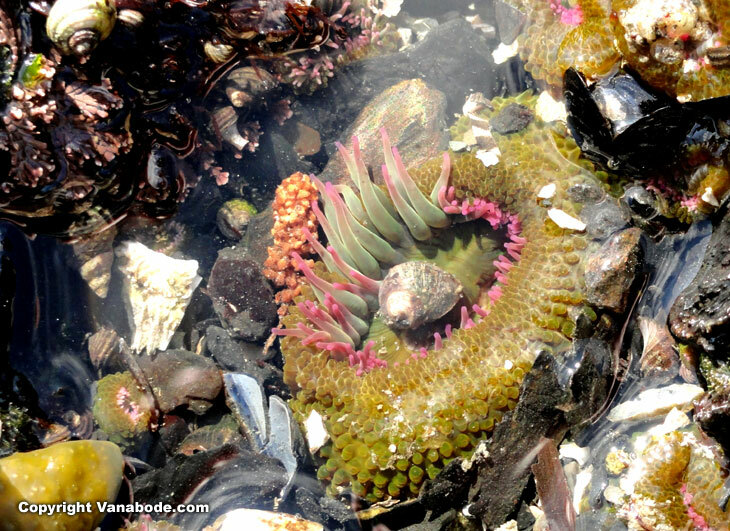 In the tidal pools of Washington's parks at low tide you can see green sea anemone, purple and red star fish, small coastal fish, sea plants, multiple colored algae's and crustaceans like barnacles, mussels, shrimp, hermit crabs, clams, scallops and more. Normally one could have a free seafood feast here but right now there are government issued warning signs everywhere stating that they are poisonous right now: the eating of just one can kill you within 30 minutes. Maybe that is why the seafood in the markets up here is so incredibly expensive. In Washington I have seen so many rivers, lakes, streams, oceans, tidal pools, and beaches that they have displaced Florida in my book as far as one having the largest QUANTITY of beautiful private places to hang out in. Obviously here in Washington it is cold, rainy, windy, overcast, and nowhere near as good weather for actually enjoying the water but they certainly have plenty of it. I am very glad we came here during the summer months because combining the stunning views and lack of biting insects with the complete availability of so many great places to Vanabode make this a top choice during this time of year. I did discover why there were not more boats along the coast in close to the beaches and islands. They are restricted by federal law and cannot come within 3 miles of these state and federally protected areas of both water and land masses. 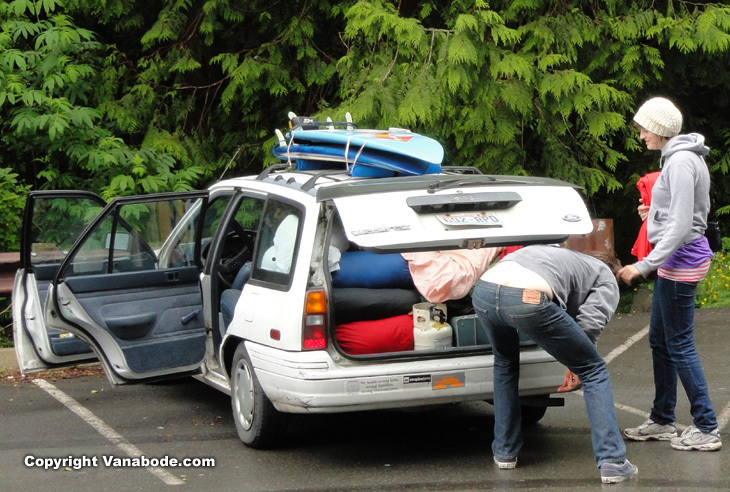 Above picture shows one of the many reasons why you should Vanabode and not car camp. This girl had just pulled her boys pants up because his crack was showing. Notice the very unsafe trunk stored propane canister. If that car gets hot or the lid gets shut on it or they get rear ended this baby could explode. We had both friends and neighbors tell us what was worth our gas and time to visit while traveling through Vancouver and Washington. Driving along the scenic highway of Chuckanut on north Washington coast was one of those suggestions, and yes, we were very glad to have had all this valuable information. Chuckanut Drive is considered to be one of Washington state's most scenic drives and we agree that it is a must do if you have the time, much prettier than I-5. It's very scenic and winding through small towns with antique stores and restaurants. We stopped at Larrabee State Park to check out the coast. It was a short walk from the parking lot to the beach. There was just a little patch of sand to walk around but that was flanked by rocks. Because we got here during low tide we got to see lots of creatures, some expected and one that was not. We saw a massive raccoon salvaging saucer sized fish, shellfish, and other marine life around the rocks. The raccoon had a trail that actually crossed the pedestrian walkway to the beach, went down through the thick brush leading to the rocks and beach. Unable to escape the fish become a daily meal for the raccoon. Parking and day use is free and this is a welcome respite to the constant money being taken from us in Canada. Along the northern coast we saw a lot of shellfish beds where oysters were being farm raised right in the shallow bay. The beds are more noticeable during low tide, however. Driving south along Chuckanut Drive we detoured onto Bow Hill Road towards the town of Edison. 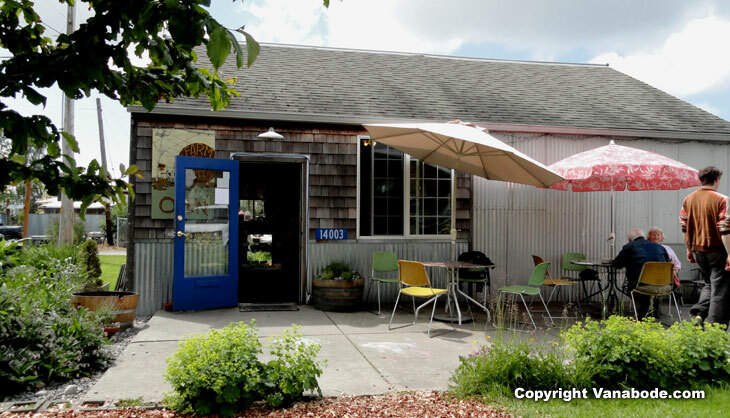 We ate lunch at Farm to Market Bakery which is at the corner of Gilmore and Farm to Market Road. I ordered the rustic crusty bread panini and Kelly ate a special recipe quiche containing local eggs, wild morel mushrooms, organic artichokes, and locally made goat cheese. For dessert we had their real wild huckleberry deep dish pie. When you walk in you are basically in their kitchen, very quaint and friendly. Order and then eat outside on their patio overlooking a little flower garden that has hazelnut shells used for mulch, very cool. Take the scenic road, Bayview Edison Road, leading to Samish Island. There are many things to see along this route and little to no traffic. 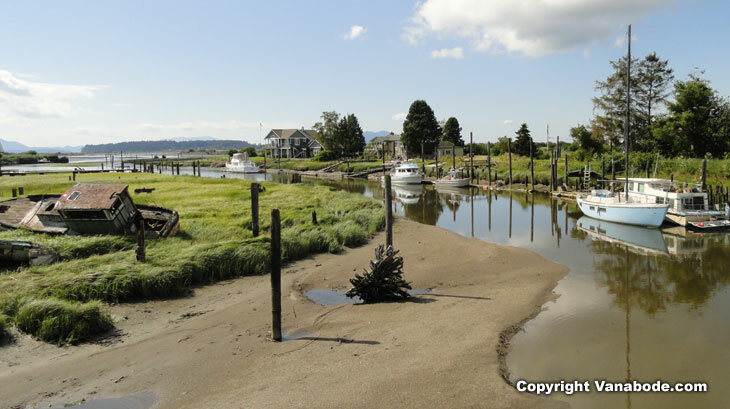 Waterways, shellfish sloughs and wildlife viewing areas plus old boatyards and farms. Continuing south we stopped at the Breazeale Padilla Bay Interpretive Center just north of Bay View State Park. The exhibits are very education to the area and the fish tanks are simple but beautifully filled with estuarian fish and shellfish. We took Highway 20 to Deception Pass State Park, Whidbey Island (which by the way does not have a seafood restaurant), Coupeville (Christopher's restaurant), Clinton Ferry to Mukilteo then on to Seattle. You should stop and visit any and every state park that is on the water or close to it. These in Washington are free to enter and use for the day, eat, grill out, hike, play, boat, fish, and even swim if you have a wet suit. This park system is a real joy and worth every ounce of gasoline it takes to get here. Many of the parks have hot showers for 3 minutes for 2 quarters and they all have plenty of parking and shady as well as sunny spots to hang out in, endless photo opportunities beachside in the crashing waves and tidal pools and in the heavy dark wooded forests. MAKE and SEE CHART FOR AMENITIES. Washington is known for their wines and there are many regions throughout the state for wine tasting. We visited a few wineries and tasting rooms in the southeast along I-82 in Prosser. Washington is a premium wine producing state and although it is relatively young in the wine industry, it is the nation's second largest wine producer as well as being ranked among the world's top wine regions. Another recommendation we were told about was Leavenworth, a Bavarian village on the east side of the Cascade Mountains. We spent half our day hiking along the Icicle River and the other half walking the streets. We had an unforgettable dinner at a German restaurant and of course had some pastries for dessert. This is a great place to vacation all year long as the activities abound both summer and winter. The further north we traveled along US97 in central Washington the less populated it became. Olympic National Park covers a large area of the northwestern part of Washington but traveling back and forth on roads and going the long way around to see different point of interests is worth every gallon of fuel. 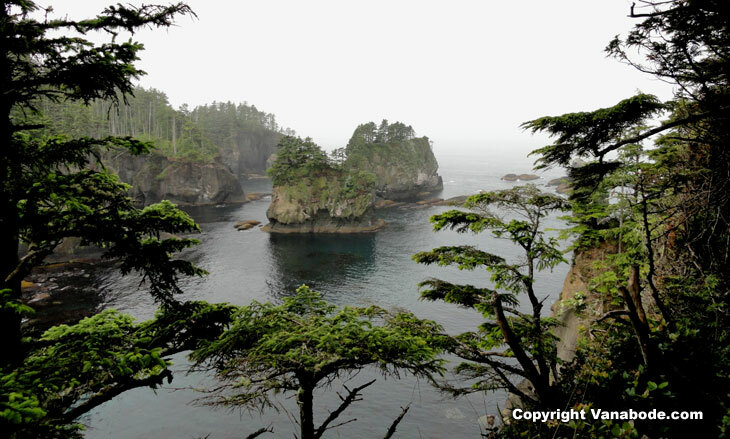 Cape Flattery is one of those drives but when you see this place you understand why it is protected to this extent. The hike to Shi Shi Beach will get your shoes and maybe your pants muddy but exploring and climbing over the rocks is fun and an entire experience you or your family will never forget. You can spend the night on the beach and have a bonfire too. This page is part of a 20 day, 2,866 mile, Vanabode trip. See van camping Nevada Washington Oregon Canada for an overview of this particular trip. Visit travel destinations for our master list of 100's of cool places visited that we have reviews on. Vanabode travel and live anywhere in America on $20 a day including food, lodging and transportation. How will this book help Me?